giovedì 3 maggio dalle 9.30 alle 11.00; su appuntamento scrivendo a jezek@unipv.it. Lo studio della docente è presso il Cortile Teresiano, Palazzo Centrale. Dal 1 settembre 2018 il programma dei corsi dell'AA 2018-2019 è disponibile sul catalogo degli insegnamenti di Ateneo. Happy to join the new board of AILC Associazione Italiana di Linguistica Computazionale - Italian Association of Computational Linguistics (2019-2021). 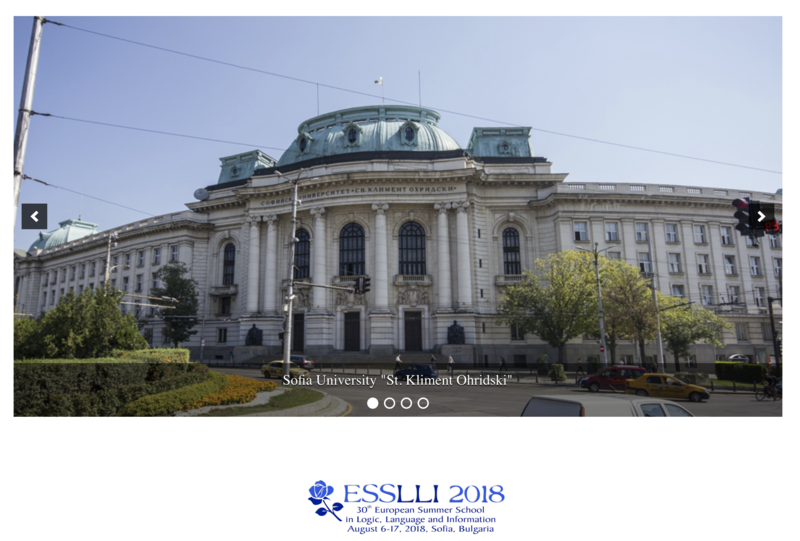 Foundational Course THE LEXICON: AN INTERDISCIPLINARY INTRODUCTION at ESSLLI 2018, 30th European Summer School in Logic Language and Information, Sofia, Bulgaria, August 5-10. Ph.D. (2001) Roma Tre University, in Linguistics. Dissertation: Verb Classes at the Syntax-Semantic Interface. M.A. (1992) Trento University, in Modern Foreign Languages and Literature. 2015-ongoing, Associate Professor, Department of Humanities, Section of Theoretical and Applied Linguistics, Pavia University. 2016 Research leave at Queen Mary University of London, School of Engineering and Computer Science, Fall Semester. 2001-2015 Assistant Professor, Department of Linguistics, Pavia University. 2006-2009 Consultant for Dizionario Analogico Utet project at UTET Publishing, Torino. 2005-2008 Consultant for Dizionario Italiano Sabatini Coletti project at Rizzoli Publishing, Milano. 2007 Visiting Scholar (during sabbatical leave) at Masaryk University, Laboratory for Natural Language Processing, Brno, Czech Republic (June); National University of Seoul, Dep. of French Language and Literature, South Korea (May); Brandeis University, Laboratory for Linguistics and Computation, Waltham Mass. (March-April). 2000-2001 Postdoctoral Researcher on project Verb classes, Argument Structure and Second Language Acquisition, Trento University. 2000-2001 Lexicographer for Dizionario Italiano dei Sinonimi e dei Contrari, Roma, Istituto dell’Enciclopedia Italiana G. Treccani. 2000-2001 Lexicographer for Dizionario Conciso della Lingua Italiana, Roma, Istituto dell’Enciclopedia Italiana G. Treccani. 1999 Visiting Researcher, fall semester, Laboratory for Linguistics and Computation, Brandeis University, Waltham Mass. 1997-2000 PhD grant on research project Verb Classes at the Syntax-Semantic Interface, Roma Tre University, Dept. of Linguistics. 1994-1997 Lexicographer for Italiaans-Nederlands Nederlands-Italiaans Woordenboek, Utrecht, Van Dale Lexicographie. 1994-1995 EU Postgraduate grant COMETT for research project ItalNed Italiaans-Nederlands Lexicon, University of Amsterdam, Dept. of Italian Linguistics. 1993 Postgraduate grant NUFFIC, Netherlands Organization for International Cooperation in Higher Education at Free University of Amsterdam, Institute for Lexicology; University of Amsterdam, Dept. of Italian Linguistics. 1992 Traineeship at European Parliament, Translation Division, Luxembourg. 1992 Traineeship at European Parliament, Division for Data processing, Language and Documentation Support, Luxembourg. Società di Linguistica Italiana (National Secretary from 2005 to 2014); Società Italiana di Glottologia, Societas Linguistica Europaea, European Association for Lexicography, Associazione Italiana di Linguistica Computazionale (Member of the Board of Directors from Jan. 2019 till Dec. 2021), Associazione Senso Comune. The meaning of words. Semantic flexibility in language. Lexicon, pragmatics and cognition. Verb classification. Theory of Argument Structure. Event structure in syntax and semantics. Word class systems from a typological perspective. Computational Lexicography. Language Technology. Methodology in linguistic research. 2016-2018 Programma di Ricerca Scientifica di Rilevante Interesse Nazionale (PRIN), Italian Ministry of Education, University and Research. Transitivity and Argument Structure in Flux (in collaboration with Università di Napoli Federico II). 2016-2017 Fondi di Ateneo per la Ricerca (FAR), Pavia University. Linguistic Patterns for political legitimation in the media: a lexical semantic study based on distributional methods (in collaboration with School of Electronic Engineering and Computer Science, Queen Mary, University of London). 2014-2016 Fondi di Ateneo per la Ricerca (FAR), Pavia University. T-PAS (typed predicate-argument structures) and the linguistic analysis of textual entailment relations (in collaboration with PhD School in Language Sciences, Pavia/Bergamo, and Fondazione Bruno Kessler, Trento). 2013 Fondi di Ateneo per la Ricerca (FAR), Pavia University. Towards a corpus annotated with semantic and syntactic verbal patterns for Italian (in collaboration with PhD School in Language Sciences, Pavia). 2012 Fondi di Ateneo per la Ricerca (FAR), Pavia University. CPA-Italian-Excitement (in collaboration with Fondazione Bruno Kessler, Human Language Technology, Trento). 2011 Fondi di Ateneo per la Ricerca (FAR), Pavia University. Semantic role annotation (in collaboration with Senso Comune, Roma). 2011 Thyssen Stiftung, Germany. Argument Struktur in Texten (in collaboration with Silvia Luraghi, Pavia University, Christian Lehmann (Erfurt University). 2010-2011 Fondi di Ateneo per la Ricerca (FAR), Pavia University. Qualia Annotation in Compounds (in collaboration with P. Bouillon, TIM/ISSCO University of Geneva). 2008 Fondi di Ateneo per la Ricerca (FAR), Pavia University. PDIV. A Pattern Dictionary of Italian Verbs (in collaboration with P. Hanks, Masaryk University, Brno). 2007 Fondi di Ateneo per la Ricerca (FAR), Pavia University. Polisemia nominale e operazioni di coercion. 2006 Fondi di Ateneo per la Ricerca (FAR). Pavia University. La categoria dell’aspetto nella sintassi e nel lessico. 2004 European Science Foundation. The comparative approach to L2 acquisition. Coordinator: W. Klein (Max Planck Institute for Psycholinguistics, Nijmegen). 2004-05 Fondi di Ateneo per la Ricerca (FAR), Pavia University. Linguistica tipologica in prospettiva areale e diacronica. Coordinator: P. Ramat (Pavia). 2004 Fondi di Ateneo per la Ricerca (FAR). Roma Tre University. Classi di parole e loro riflessi nella grammatica e nel discorso. Coordinator: R. Simone (Roma Tre). 2003-05 Programma di Ricerca Nazionale cofinanziato (PRIN). Strategie di costruzione del lessico e fattori di organizzazione testuale nelle dinamiche di apprendimento e insegnamento di L2. National coordinator: G. Bernini (Bergamo). Local coordinator: M. Chini (Pavia). 2002-03 Fondi di Ateneo per la Ricerca (FAR), Pavia University. Dalla linguistica areale alla tipologia linguistica. Coordinator: P. Ramat (Pavia). 2001-03 Consiglio Nazionale delle Ricerche (CNR). ItalAnt. Per una grammatica dell’italiano antico. Coordinators: G. Salvi (Eötvös Loránd University, Budapest), L. Renzi (Università di Padova). Jezek E. (2016) The Lexicon: An Introduction. Oxford,Oxford University Press. Jezek E. (2005) (2nd ed. 2011) Lessico. Classi di parole, strutture, combinazioni. Bologna, Il Mulino. Jezek E. (2003) Classi di verbi tra semantica e sintassi. Pisa, Edizioni ETS. Jezek, E. (2017) Generative Lexicon Theory and Lexicography. In P. Hanks and G.M. De Schrijver (eds) International Handbook of Modern Lexis and Lexicography, Berlin, Springer-Verlag GmbH. Jezek E. (2016) "Alcuni principi per costruire risorse lessicali". In Ponti, E. e M. Budassi (a cura di) Compter, parler, soigner. Tra linguistica e Intelligenza Artificiale, Pavia, Pavia University Press. Jezek E., Pecorari P. (2014) "Associative Anaphora between event-denoting antecedents", with Filippo Pecorari. In E. Hilgert et al. (dir.) Res-per-nomen IV: Théories du sens et de la réference, Reims: Editions et Presses Universitaires de Reims, 627-643. Jezek E. (2014). Classes of Creation Verbs. In: Simone R., Masini F. (eds). Word Classes: Nature, Typology, Computational Representations. Amsterdam – Philadelphia: Benjamins, p. 37-50. Jezek E. (2014). Lessico e semantica. In M. Chini e C. Bosisio (a cura di) Fondamenti della glottodidattica. Apprendere e insegnare le lingue oggi. Roma, Carocci, p. 131-142. Jezek E. (2014) Esistono le collocazioni? Denotazione vs. significato collocazionale. In Danler, P. Konecny C. (a cura di) Dall’architettura della lingua italiana all’architettura linguistica dell’Italia. Frankfurt a.M. et al. : Peter Lang, 409-419. Oltramari, A. Vetere, G. Chiari, I. Jezek, E. Zanzotto, F.M. Nissim, M. Gangemi, A. (2013) "Senso Comune: A collaborative Knowledge Resource for Italian". In: Iryna Gurevych and Jungi Kim (eds.). The People's Web Meets NLP: Collaboratively Constructed Language Resources, Berlin-Heidelberg, Springer. Jezek E. (2012). Inaccusativité, aspect et verbes pronominaux en italien. In: Bracquenier C., Begioni L. (dir). L'aspect dans les langues naturelles. Approche comparative. p. 159-178, Rennes: Presses Universitaires de Rennes. Jezek E. (2010). Struttura argomentale dei verbi. In: L. Renzi , G. Salvi (a cura di). Grammatica dell'Italiano Antico. p. 77-122, Bologna: Il Mulino. Jezek E., Frontini F. (2010). From Pattern Dictionary to Patternbank. In: De Schrijver, G.M. (ed). A Way with Words: Recent Advances in Lexical Theory and Analysis. p. 215-239, Kampala: Menha Publishers. Jezek E. (2010). Struttura Argomentale dei Verbi. Teoria Linguistica e Applicazioni Lessicografiche. In: Luquet G., Nowikow W.. La recherche en langues romanes. Théories et Applications. p. 159-176, Lodz:Lodz Academy of International Studies - Université Sorbonne Nouvelle - Paris 3. Jezek E. (2009). Tipi di ricostruzioni metonimiche. In: L. Mereu, E. Lombardi Vallauri (a cura di). Spazi Linguistici. p. 173-189, ROMA: Bulzoni. Jezek Elisabetta (2006). Costruzioni con verbo proniminale in italiano antico. In: N. Grandi, G.Iannaccaro (a cura di). Zhì. Scritti in onore di Emanuele Banfi. p. 303-320, Roma: Caissa Editore. Jezek E. (2005). Verbi, eventi e quadri argomentali in italiano L2. In: N. Grandi (a cura di). Morfologia e dintorni. Studi di linguistica tipologica e acquisizionale. p. 179-196, Milano: Franco Angeli. Lo Cascio V., Jezek E. (1999). Thematic Roles and Aspect in Italian Pronominal Verbs: a Lexicological Study. In: L. Mereu (ed). Boundaries of Morphology and Syntax. p. 253-270, Amsterdam - Philadelphia: Benjamins. 2017 "Experimental Results on Exploiting Predicate-Argument Structure for Verb Similarity in Distributional Semantics", with Benjamin Blundell and Mehrnoosh Sadrzadeh. CLASP Papers in Computational Linguistics, vol. 1, pp. 99-106. 2017 "Stretching the Meaning of Words: Constrains and Gradeness in Semantic Coercion", CLASP Papers in Computational Linguistics, vol. 1, pp. 91-98. 2017 "Dynamic Argument Structure", with James Pustejovsky. Linguistic Issues in Language Technology (LiLT), vol 15, issue 3, pp. 1-35. 2017 "Distributed Representations of Lexical Sets and Prototypes in Causal Alternation Verbs", with Edoardo Maria Ponti and Bernardo Magnini. Italian Journal of Computational Linguistics, vol. 3 n. 1. 2012 "Senso Comune: An Open Knowledge Base for Italian", with Guido Vetere, Alessandro Oltramari, Isabella Chiari, Laure Vieu, Fabio Massimo Zanzotto. In Traitement Automatique des Langues (TAL) 52, 3: 217-243. 2011 "Nominals, Polysemy and Co-predication", with Chiara Melloni. In Journal of Cognitive Science (JCS), 12, 1-31. 2011 "Verbes Supports et Composition Sémantique". In Cahier de Lexicologie 1, 98, 29-44. 2010 "What lexical sets tell us about conceptual categories", with Patrick Hanks. In Corpus Linguistics and the Lexicon, special issue of Lexis, E-Journal in English Lexicology, 4, 7-22. 2009 "On parts-of-speech transcategorization", with Paolo Ramat. In Folia Linguistica 43/2, 391-416. 2008 "Semantic Coercion in Language: Beyond Distributional Analysis", with James Pustejovsky. In A. Lenci (ed.) Distributional Models of the Lexicon in Linguistics and Cognitive Science, special issue of Italian Journal of Linguistics 20, 1, 181-214. 2008 "Polysemy of Italian Event Nominals". In R. Mir-Samii (éd.) Nominalisations. Special issue of Faits des Langues 30: 251-264. 2004 "Interazioni fra Aspetto e Diatesi nei verbi pronominali italiani". In Studi di Grammatica Italiana. Vol. XXIII, 239-281. 2004 "Types et degrés de verbes supports en italien". In G. Gross – S. De Pontonx (éds) Les verbes supports: nouvel état des lieux. Special issue of Linguisticae Investigationes. Vol. 27, 2, 269-285. 2000 "Classi verbali e composizionalità: il caso della doppia inaccusatività in italiano". In R. Simone (a cura di) Classi di parole e conoscenza lessicale. Special Issue of Studi Italiani di Linguistica Teorica e Applicata (SILTA) 2: 289-310. 1998 "La redazione un vocabolario bilingue: aspetti e problemi". In D. Veronesi (a cura di) Incontri di Linguistica, Accademia Europea, Bolzano, Quaderni/Arbeitshefte 7: 31-40. 2017 "A Geometric Model for Detecting Semantic Coercion", with Stephen McGregor, Matthew Purver and Geraint Wiggings. Proceedings of the 12th International Workshop on Computational Semantics (IWCS), LIRMM - University of Montpellier. 2017 "Semantic Relations in Compound Nouns Perspectives from Inter-Annotator Agreement", with Prabha Yadav, Pierrette Bouillon, Tiffany J. Callahan, Michael Bada, Lawrence E. Hunter, Kevin Bretonnel Cohen. Proceeding of MEDINFO 2017, Hangzhou, China. 2016 "Grounding Lexical Sets of Causative/Inchoative Verbs with Word Embedding", with Edoardo Maria Ponti and Bernardo Magnini. In Basile P. et al. (eds) Proceeding of the Third Italian Conference of Computational Linguistics (CliC-it 2016), CEUR-WS.org. Best paper award at CliC-it 2016. 2016 "LICO: A Lexicon of Italian Connectives", with Anna Feltracco, Bernardo Magnini and Manfred Stede. In Basile P. et al. (eds) Proceeding of the Third Italian Conference of Computational Linguistics (CliC-it 2016), CEUR-WS.org. 2016 "Mapping Semantic Types to WordNet synsets", with Anna Feltracco, Lorenzo Gatti, Simone Magnolini and Bernardo Magnini. In Harry Bunt et al. (In Press) Proceeding of the Twelfth ACL - ISO Workshop on Interoperable Semantic Annotation at Language Resourcers and Evaluation Conference (LREC 2016), Portoroz, Slovenia, ELRA, Paris. 2016 "Aquiring Opposition Relations among Italian Verb Senses using Crowdsourcing", with Anna Feltracco, Lorenzo Gatti, Simone Magnolini and Bernardo Magnini. In Calzolari N. et al. Proceeding of Language Resourcers and Evaluation Conference (LREC 2016), Portoroz, Slovenia, ELRA, Paris. 2016 "Using WordNet to build Lexical Sets for Italian Verbs", with Anna Feltracco, Lorenzo Gatti, Simone Magnolini and Bernardo Magnini. In Barbu Mititelu V., Forascu, C., Fellbaum C. and P. Vossen (eds) Proceedings of the Eight International Global WordNet Conference, Bucharest, Romania, January 27-30, 2016, 100-104. 2015 "Annotating Opposition Relations among Verb Senses: a Crowdsourcing Experiment", with Anna Feltracco, Bernardo Magnini, Simone Magnolini. In Bosco, C., Tonelli S., Zanzotto, F.M. (eds) Proceedings of the Second Italian Conference on Computational Linguistics CLIC-it 2015 (Dec. 3-4, 2015), Torino: Accademia University Press, 135-140. 2015 "Quantitative Methods for identifying Systematic Polysemy Classes", with Laure Vieu and Tim van de Cruys. In Proceedings of the 6th Conference on Quantitative Investigations in Theoretical Linguistics (QITL-6), Eberhard Karls University, Tuebingen (Nov 4-6, 2015). 2015 "Corpus Patterns for Semantic Processing", with Patrick Hanks, Daisuke Kawahara, Octavian Popescu. Proceeding of the Tutorials of the 53rd Annual Meeting of the Association for Computational Linguistics (ACL) and 7th International Joint Conference on NLP of the Asian Federation of NLP (IJCNLP), Beijing, China, July 26-31, 2015, Association for Computational Linguistics, 12-15. 2015 "Opposition Relations among Verb Frames", with Anna Feltracco and Bernardo Magnini. In Proceedings of the 3rd Workshop on EVENTS at the NAACL-HTL 2015, Denver, Colorado, (June 4, 2015), Association for Computational Linguistics, 16-24. 2015 "Instrument Subjects without Instrument Role", with Rossella Varvara. In Bunt, H. (ed) Proceedings of the Eleventh Joint ACL-ISO Workshop on Interoperable Semantic Annotation at International Conference on Computational Semantics (IWCS 2015), Queen Mary University, London, UK (April 14, 2015), 46-54. 2014 "Distributional analysis of copredication: Towards distinguishing systematic polysemy from coercion", with Laure Vieu. In Basili, R., Lenci A., Magnini, B. (eds) Proceedings of the First Italian Conference on Computational Linguistics CLIC-it 2014 (Dec. 9-10, 2014), Pisa: Pisa University Press, 219-223. 2014 "Senso Comune as a Knowledge Base of Italian Language; the Resource and its Development", with Tommaso Caselli, Isabella Chiari, Aldo Gangemi, Alessandro Oltramari, Guido Vetere, Laure Vieu, Fabio Massimo Zanzotto. In Basili, R., Lenci A., Magnini, B. (eds) Proceedings of the First Italian Conference on Computational Linguistics CLIC-it 2014 (Dec. 9-10, 2014), Pisa: Pisa University Press, 93-97. 2014 "Towards disambiguating Typed Predicate-Argument Structures for Italian", with Octavian Popescu, Vo Ngoc Phuoc An, Anna Feltracco, Bernardo Magnini. In Basili, R., Lenci A., Magnini, B. (eds) Proceedings of the First Italian Conference on Computational Linguistics CLIC-it 2014 (Dec. 9-10, 2014), Pusa: Pisa University Press, 306-310. 2014 "Semantic role annotation of Instrument Subjects" with Rossella Varvara. In Basili, R., Lenci A., Magnini, B. (eds) Proceedings of the First Italian Conference on Computational Linguistics CLIC-it 2014 (Dec. 9-10, 2014), Pisa: Pisa University Press, 384-388. 2014 "T-PAS; A resource of Typed Predicate Argument Structures for linguistic analysis and semantic processing", with Bernardo Magnini, Anna Feltracco, Alessia Bianchini, Octavian Popescu. In Nicoletta Calzolari et al. (eds) Proceedings of the Ninth International Conference on Language Resources and Evaluation (LREC'14), Reykjavik, Iceland (May 26-31, 2014), Paris: European Language Resources Association (ELRA), 890-895. 2014 "Enriching Senso Comune with Semantic Role Sets", with Laure Vieu, Fabio Massimo Zanzotto, Guido Vetere, Alessandro Oltramari, Aldo Gangemi, Rossella Varvara. In Harry Bunt et al. (eds) Proceedings of the Tenth Joint ACL-ISO Workshop on Interoperable Semantic Annotation, Reykjavik, Iceland (May 26, 2014), 88-94. 2013 "An open knowledge base for Italian Language in a collaborative perspective", with Isabella Chiari, Aldo Gangemi, Alessandro Oltramari, Guido Vetere. In Proceedings of the 1st International Workshop on Collaborative Annotations in Shared Environment: metadata, vocabularies and techniques in the Digital Humanities, ACM Press. 2013 "Verbal Phrase Translation", with Octavian Popescu. In Tralogy 2013 Proceedings, Paris (January 17-18, 2013). 2012. "Acquiring typed-predicate argument structures from corpora". In Harry Bunt et al. (eds) Proceedings of the Eighth Joint ACL-ISO Workshop on Interoperable Semantic Annotation, Pisa (Oct 3-5, 2012), 28-33. 2012. "Sui nomi di risultato (e i loro verbi base) in italiano". In V. Bambini et al. (a cura di) Atti del XLII Congresso Internazionale di Studi della Società di Linguistica Italiana. Roma: Bulzoni. 2011. "The anticausative alternation in Italian", with Michela Cennamo. In G. Massariello Merzagora et al. (a cura di) Atti del XLIII Congresso Internazionale di Studi della Società di Linguistica Italiana. Roma: Bulzoni. 2010 “Capturing Coercions in Texts: a First Annotation Exercise”, with Valeria Quochi. In Nicoletta Calzolari et al. (eds) Proceedings of the Seventh conference on International Language Resources and Evaluation (LREC'10), Valletta, Malta (May 19-21, 2010), Paris: European Language Resources Association (ELRA), 1464-1471. 2010 "La Struttura argomentale. Teoria linguistica e applicazioni lessicografiche". In G. Luquet et W. Nowirow (eds) Actes du Colloque International sur La recherche en langues romanes: théories et applications (Paris, Université Sorbonne Nouvelle-Paris III, June 29-30), Lodz Academy of International Studies, 159-176. 2010 "Verbi sintagmatici in italiano antico e moderno: un’analisi corpus-based", with Francesca Strik Lievers. In Maria Iliescu (et al.) Actes du XXVe CILPR Congrès International de Linguistique et de Philologie Romanes, Berlin - New York: De Gruyter. 445-454. 2009 "Relevance of Qualia Relations in Coercive Contexts", with Valeria Quochi and Nicoletta Calzolari. In P. Bouillon et al. (eds) Proceedings of the 5th International Conference on Generative Approaches to the Lexicon, Pisa, ILC-CNR, Sept. 17-19, 2009. 128-136. 2009 "Complex type in the (morphologically) complex lexicon", with Chiara Melloni. In P. Bouillon et al. (eds) Proceedings of the 5th International Conference on Generative Approaches to the Lexicon, Pisa, ILC-CNR, Sept. 17-19, 2009. 59-67. 2009 "Argument structure binding and event nominal polysemy". In Current Issues in Unity and Diversity of Languages. Collection of the papers selected from the CIL 18, Held at Korea University in Seoul, July 21-26, 2008. Published by LSK, The Linguistic Society of Korea, Republic of Korea, 1189-1209. 2008 "Shimmering Lexical Sets", with Patrick Hanks. In E. Bernal - J. De Cesaris (eds) Proceedings of the XIII EURALEX International Congress. Barcelona: Universidad Pompeu Fabra, 391-402. 2008 "Gradiente di inaccusatività e verbi pronominali nell’apprendimento dell’italiano come seconda lingua", with Stefano Rastelli. In G. Bernini et al. (a cura di) Competenze lessicali e discorsive nell’acquisizione di lingue seconde. Perugia: Guerra Edizioni, 95-115. 2007 "When GL meets the corpus: a data-driven investigation of semantic types and coercion phenomena", with Alessandro Lenci. In P. Bouillon - K. Kanzaki (eds.) Proceedings of the Fourth International Workshop on Generative approaches to the Lexicon, Université Paris VII. 2006 "Argument Structure, Verb Patterns and Dictionaries". In C. Marello et al. (eds.) Proceedings of the XII EURALEX International Congress. Alessandria: Edizioni dell’Orso, 1169-1180. 2004 "Classi di Verbi Italiani tra Semantica e Sintassi". In A. Rocchetti, M. Giacomo Marcellesi, S. Lazard (a cura di) Il verbo italiano, Atti del XXXV Congresso SLI. Roma: Bulzoni, 251-263. 2002 "Lo sfondamento di un confine tipologico: il caso dei verbi complessi in italiano". In P. Cordin et al. (a cura di) Parallela VIII. Lingue di confine, confini di fenomeni linguistici. Roma: Bulzoni, 289-308. 2001 "Gradual vs. Total Completion and Event Structure in Italian Unaccusative Verbs". In P. Bouillon and K. Kanzaki (eds), Proceedings of the 1st International Workshop on Generative Approaches to the Lexicon. Université de Genève, École de Traduction et d’Interprétation. 1998 "Traces of coalescence in Italian complex predicates". In S. Mejri, G. Gross, A. Clas, T. Baccouche (éds) Le Figement Lexical. Actes de la Iere Rencontre Linguistique Méditerranéenne, Université de Tunis I, 343-350. 2011 Verbi. In R. Simone et al. (eds.) Enciclopedia dell’Italiano, Roma, Treccani. 2011 Verbi pronominali. In R. Simone et al. (eds.) Enciclopedia dell’Italiano, Roma, Treccani. 2011 Verbi supporto. In R. Simone et al. (eds.) Enciclopedia dell’Italiano, Roma, Treccani. 2011 Verbi inergativi. In R. Simone et al. (eds.) Enciclopedia dell’Italiano, Roma, Treccani. 2011 Verbi Inaccusativi. In R. Simone et al. (eds.) Enciclopedia dell’Italiano, Roma, Treccani. 2011 Nomi di risultato. In R. Simone et al. (eds.) Enciclopedia dell’Italiano, Roma, Treccani. 2011 Definizione Lessicale. In R. Simone et al. (eds.) Enciclopedia dell’Italiano, Roma, Treccani. 2011 P. Pietrandrea Epistemic Modality. Recensione in Archivio Glottologico Italiano 2/2010. 2005 Verbi italiani transitivi e intransitivi. In La Crusca per Voi 30, Accademia della Crusca. 2017 "A Geometric Model for Detecting Semantic Coercion", with Stephen McGregor, Matthew Purver and Geraint Wiggings. International Workshop on Computational Semantics (IWCS), University of Montpellier, Sept. 19-22. 2017 "Stretching the meaning of words". Conference on Logic and Machine Learning in Natural Language (LaML), Centre for Linguistic Theory and Studies in Probability (CLASP), University of Gothenburg (June 12-14). 2017 "Empirical Evidence for the study of coercion mechanisms in predicate-argument composition". 39. Jahrestagung der Deutschen Gesellschaft für Sprachwissenschaft, Coercion Across Linguistic Fields Workshop, Universität des Saarlandes, Saarbrücken (March 8-10). 2016 "Grounding Lexical Sets of Causative/Inchoative Verbs with Word Embedding", with Edoardo Ponti and Bernardo Magnini. Third Italian Conference of Computational Linguistics (CliC-it 2016), Università Federico II, Naples (Dec 5-6). 2016 "LICO: A Lexicon of ItalianConnectives", with Anna Feltracco, Bernardo Magnini and Mandred Stede. 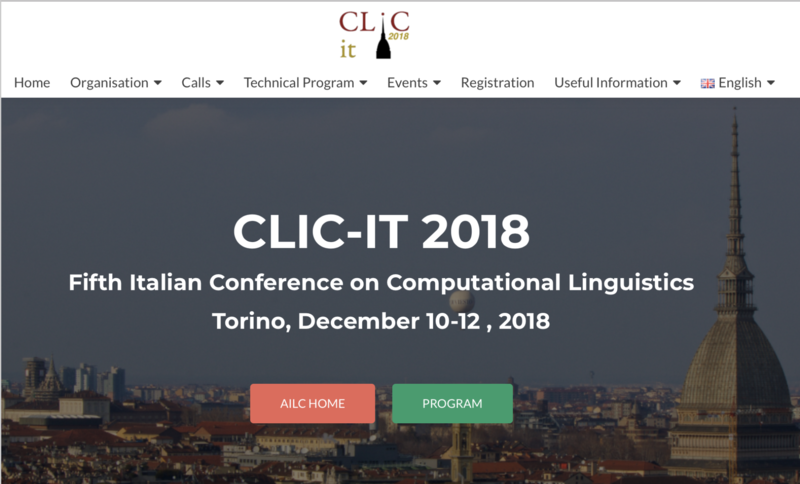 Third Italian Conference of Computational Linguistics (CliC-it 2016), Università Federico II, Naples (Dec 5-6). 2016 "Grounding the Lexical Sets of Causative-Inchoative Verbs with Word Embedding", with Edoardo Maria Ponti and Bernardo Magnini. DSALT: Distributional Semantics and Linguistic Theory, Workshop at The 28th European Summer School in Logic, Language and Inormation (ESSLLI 2016), Free University of Bozen - Bolzano (August 15-19). 2016 "From Lexicon to Text. Associative Anaphora between event-denoting expressions", with Filippo Pecorari. Chronos 12th International Conference on Actionality, Tense, Aspect, Modality/Evidentiality, Université Caen Normandie (June 15-17). 2016 "Mapping Semantic Types to WordNet synsets", with Anna Feltracco, Lorenzo Gatti, Simone Magnolini and Bernardo Magnini. Twelfth ACL - ISO Workshop on Interoperable Semantic Annotation at Language Resourcers and Evaluation Conference (LREC 2016), Portoroz, Slovenia (May 28). 2016 "Aquiring Opposition Relations among Italian Verb Senses using Crowdsourcing", with Anna Feltracco, Lorenzo Gatti, Simone Magnolini and Bernardo Magnini. Language Resourcers and Evaluation Conference (LREC 2016), Portoroz, Slovenia (May 25-27). 2016 "Using WordNet to build Lexical Sets for Italian Verbs", with Anna Feltracco, Lorenzo Gatti, Simone Magnolini and Bernardo Magnini. Eight International Global WordNet Conference (GWN), Bucharest, Romania (January 27-30). 2015 "Annotating Opposition Relations among Verb Senses: a Crowdsourcing Experiment", with Anna Feltracco, Bernardo Magnini, Simone Magnolini. Second Italian Conference on Computational Linguistics CLIC-it 2015 (Dec. 3-4, 2015), Trento. 2015 "Quantitative Methods for identifying Systematic Polysemy Classes", with Laure Vieu and Tim van de Cruys. 6th Conference on Quantitative Investigations in Theoretical Linguistics (QITL-6), Eberhard Karls University, Tuebingen (Nov 4-6, 2015). 2015 "Opposition Relations among Verb Frames", with Anna Feltracco and Bernardo Magnini. 3rd Workshop on EVENTS at the NAACL-HTL 2015, Denver, Colorado, (June 4, 2015). 2015 "Instrument Subjects without Instrument Role", with Rossella Varvara. Eleventh Joint ACL-ISO Workshop on Interoperable Semantic Annotation at International Conference on Computational Semantics (IWCS 2015), Queen Mary University, London, UK (April 14, 2015). 2014 "Distributional Analysis of copredication: Towards Distinguishing Systematic Polysemy from Coercion", with Laure Vieu. First Italian Conference on Computational Linguistics, (CLIC-it 2014), Pisa (Dec. 9-10). 2014 "Semantic Role Annotation of Instrument Subjects", with Rossella Varvara. First Italian Conference on Computational Linguistics, (CLIC-it 2014), Pisa (Dec. 9-10). 2014 "Senso Comune as a Knowledge base for Italiana: the Resource and its Development, with Tommaso Caselli, Isabella Chiari, Aldo Gangemi Alessandro Oltramari, Guido Vetere, Laure Vieu, Fabio Massimo Zanzotto. First Italian Conference on Computational Linguistics, (CLIC-it 2014), Pisa (Dec. 9-10). 2014 "Towards Disambiguating Typed Predicate-Argument Structures for Italian", with Octavian Popescu, Ngoc Phuoc An Vo, Anna Feltracco, Bernardo Magnini. First Italian Conference on Computational Linguistics, (CLIC-it 2014), Pisa (Dec. 9-10). 2014 "Semantic Roles between Verbs and Context". Syntax of the World's Languages VI, Pavia (Sept. 8-10). 2014 "Enriching Senso Comune with Semantic Role Sets", with Laure Vieu, Fabio Massimo Zanzotto, Guido Vetere, Alessandro Oltramari, Aldo Gangemi, Rossella Varvara. Tenth Joint ACL-ISO Workshop on Interoperable Semantic Annotation, Reykjavik, Iceland (May 26, 2014). 2013. "Verbal Phrase Translation", with Octavian Popescu. Tralogy 2013, CNRS Headquarters, Paris (January 17-18, 2013). 2012. "Interfacing typing and role constraints in annotation". Eighth Joint ACL-ISO Workshop on Interoperable Semantic Annotation, University of Pisa, Oct 3-5, 2012. 2011 "Scale Shifting and Compositionality", with James Pustejovsky. Workshop on Scalarity in Verb-Based Constructions, Heinrich-Heine-Universität, Düsseldorf, Germany, April 7-8 2011. 2010 “SemEval Task 7: Argument Selection and Coercion”, with James Pustejovsky, Anna Rumshisky, Alex Plotnick, Olga Batiukova and Valeria Quochi, 5th International Workshop on Semantic Evaluation held at 48th Annual Meeting of the Association for Computational Linguistics (Uppsala University, Sweden, July 11–16, 2010). 2010 "Semantic role assignment: Between Verb and Context". International Workshop on Semantic Roles, Pavia University, May 19-20 2010. 2010 "Verbs of creation". Conference on Word Classes: Nature, Typology and Computational Representations, Roma Tre University, March 24-26 2010. 2009 "Ruolo delle relazioni Qualia nei meccanismi di "coercion": proposte teoriche e evidenze empiriche per la risoluzione della metonimia". Eventualità Temporalità, Testualità: Aspetti Teorici e Computazionali, ILC-CNR Pisa / Universita' di Pavia, Nov. 19-20, 2009. 2009 "Relevance of Qualia Relations in Coercive Contexts", with Valeria Quochi and Nicoletta Calzolari. 5th International Conference on Generative Approaches to the Lexicon, Pisa, ILC-CNR, Sept. 17-19, 2009. 2009 "Complex type in the (morphologically) complex lexicon", with Chiara Melloni. 5th International Conference on Generative Approaches to the Lexicon, Pisa, ILC-CNR, Sept. 17-19, 2009. 2009 "Modes of coming into being". Workshop on Scalarity and Event Structure, Chronos 9, Paris, Paris VII - The University of Chicago Centre in Paris, Sept. 2-4, 2009. 2009 "Inherent Polysemy of Action Nominals". JSM09, Journées de Sémantique et Modalisation, Laboratoire de Linguistique Paris VII Diderot, April, 8-9, with Chiara Melloni. 2009 "The Anticausative Alternation in Italian: Constraints and Variation". Conference on Verb Typologies Revisited: a Cross-linguistic Reflection on Verbs and Verb Classes. Ghent University, Ghent, Feb. 5-7, with Michela Cennamo. 2008 "Sui nomi di risultato in italiano", XLII Congresso Internazionale di Studi della Società di Linguistica Italiana, Pisa, Scuola Normale Superiore, Sept. 25-27. 2008 "Explorations in Semantic Coercion". 40th Annual Meeting of the Societas Linguistica Europaea (SLE), 'Languages in Contrast Grammar, Translation, Corpora', Università di Bologna – Forlì, Sept. 17-20. 2008 "Argument structure binding and event nominal polysemy". CIL 18. XVIII International Conference of Linguists, Seoul, Korea University, July 22-26. 2008 "Shimmering lexical sets", EURALEX XIII International Congress, Barcelona, Universidad Pompeu Fabra, July 15-19, with Patrick Hanks. 2007 "Verbi sintagmatici in italiano antico e moderno". XXVe Congrès International de Linguistique et de Philologie Romanes, Innsbruck, Sept. 3-8, with Francesca Strik Lievers. 2007 "A corpus-driven pattern dictionary of Italian". International Colloquium on Possible Dictionaries, Università di Roma Tre, July 6-7, with Patrick Hanks. 2007 "When GL meets the corpus: a data driven investigation of semantic types and coercion phenomena", 4th International Workshop on Generative Approaches to the Lexicon, Université Paris VII, May 10-11, with Alessandro Lenci. 2006 "Event structure and Polysemy of Italian Nominalizations". Colloque sur Les Formes Nominalisées du Verbe dans les Langues, Université Sorbonne Nouvelle-Paris III, Nov. 24. 2006 "Argument structures, verb patterns and dictionaries". EURALEX XII International Congress, Università di Torino, Sept. 6-9. 2006 "Parts of Speech Transcategorizations". 39th annual meeting of the Societas Linguistica Europaea (SLE), Relativism and Universalism in Linguistics, University of Bremen, August 30 – Sept. 2, with P. Ramat. 2006 "On Transcategorizations" Conference on Universality and Particularity in Parts-of-Speech Systems. University of Amsterdam, Amsterdam Centre for Language and Communication, June, 8-10, with Paolo Ramat. 2006 "Gradiente di inaccusatività e verbi pronominali nell’apprendimento dell’italiano come seconda lingua". Conferenza su Competenze lessicali e discorsive nell’acquisizione di lingue seconde, Università di Bergamo, June, 8-10, with Stefano Rastelli. 2006 "Struttura argomentale dei verbi e apprendimento". XIV Convegno Nazionale GISCEL su Lessico e apprendimenti, Università per Stranieri di Siena, April, 6-8. 2006 "The acquisition of Light Verb Constructions in Italian as Second Language". Annual Meeting of the Language Acquisition Research Group, Max Planck Institute for Phycholinguistics, Nijmegen, The Netherlands, March 24-25, with Fabiana Rosi. 2004 "Lexical structure of verbs: a comparison of models and formalisms". International Conference on The Lexicon: its status in the theory of language. Linguistic Association of Finland, University of Turku, Nov. 18-19. 2004 "Verbi e strutture argomentali in italiano antico". Conference on Old and Modern Italian, Istituto Italiano di Cultura, Budapest, Sept. 20. 2003 "Verbi, eventi e quadri argomentali in italiano L2". Colloquio su Morfologia, tipologia e acquisizione di lingue seconde. Università di Milano Bicocca, May 30. 2002 "Lexical structure and Language Acquisition". European Science Foundation Conference on The structure of Learner Language, Kolymbari, Crete, Oct. 12-17. 2001 "Masdar, nome di una volta e la frontiera Nome-Verbo", International Colloquium on Representation, description and use of Nouns and Verbs: linguistics and psycholinguistics approaches. Università di Salerno, Dec. 17-18, with Raffaele Simone. 2001 "Classi di verbi italiani tra Semantica e Sintassi". XXXV Congresso Internazionale della Società di Linguistica Italiana (SLI), Université Sorbonne Nouvelle-Paris III, Sept. 20-22. 2001 "Gradual vs. Total Completion and Event Structure in Italian Unaccusative Verbs". First international Workshop on Generative Approaches to the Lexicon, École de Traduction et d’Interprétation, Université de Genève, Genève, Apr. 26-28. 1999 "Classi verbali e composizionalità: il caso della doppia inaccusatività nell’italiano", International Colloquium on Word classes and Lexical knowledge, Università di Roma Tre, Rome, Dec.16-17. 1998. "Coalescence in Italian Complex Predicates", Ière Rencontre Linguistique Méditerranéenne: Le figement lexical. Université de Tunis I, Tunis, Sept. 17-19. 1998 "Lo sfondamento di un confine tipologico: il caso dei Verbi Complessi nell’italiano", Parallela VIII. Lingue di confine, confini di fenomeni linguistici, Università di Trento, Dip. di Scienze Filologiche e Storiche, Trento, Oct. 8-10. 1997 "Thematic roles and Aspect in Italian Pronominal Verbs: a lexicological study". European Colloquium on the Boundaries of Morphology and Syntax, Università di Roma Tre, Rome, Oct. 25-27, with Vincenzo Lo Cascio. 2017 "Streching the Meaning of Words: Inputs for Lexical Resources and Lexical Semantic Models". Fourth Conference of the Italian Association of Computational Linguistics, Consiglio Nazionale delle Ricerche, Roma, Dec. 11. 2017 "Partecipanti Impliciti nella Struttura Argomentale dei Verbi". Seminario "La Grammatica delle Valenze", Universita' di Trento, Dipartimento di Lettere e Filosofia, Sept. 28. 2017 ESSLLI course co-lecturer at European Summer School in Logic, Language and Information, University of Toulouse, July 17-28. 2017 "Il significato nell'uso". Scuola Invernale TRIPLE. Espansioni del lessico. Nuovi formati, nuove parole, nuovi significati. Università di Roma Tre, Feb. 13-17. 2017 "Risorse lessicali per lo studio della struttura argomentale dei verbi", Circolo Linguistico dell'Università di Bologna, Bologna, Feb. 7th. 2017 "What constitutes Communication", The London School of Economics and Political Science, London, Jan. 23. 2016 "Empirical evidence for context-sentitive lexical semantics ", Graduate Seminar at Nets, Centre for Neurocognition, Epistemology and Theoretical Syntax, Institute for Advanced Studies, Pavia, Dec. 14. 2016 "Stretching the meaning of words:context-sentitive lexical semantics and compositionality", CogSci Seminar, Queen Mary University of London, Centre for Cognitive Science, Nov. 21. 2016 "Risorse lessicali per lo studio della struttura argomentale dei verbi italiani", PhD program in "Le forme del testo", Dipartimento di Lettere e Filosofia, Trento, Sept. 30. 2016 NASSLLI 2016 course co-instructor at North American School on Logic, Language and Information, July 9-15, 2016, Rutgers University, New Brunswick. 2016 Tutorial co-instructor, LREC 2016, 10th Language Resources and Evaluation Conference, Portonoz, Slovenia, May 22-28 2016. 2016 "Introduzione allo studio del lessico", Giornata di Studio Lessico e Grammatica, Universität Basel, Philosophic-Historische, Fakultät, Departement Sprach- und Literaturwissenschaften, Basel, May 19. 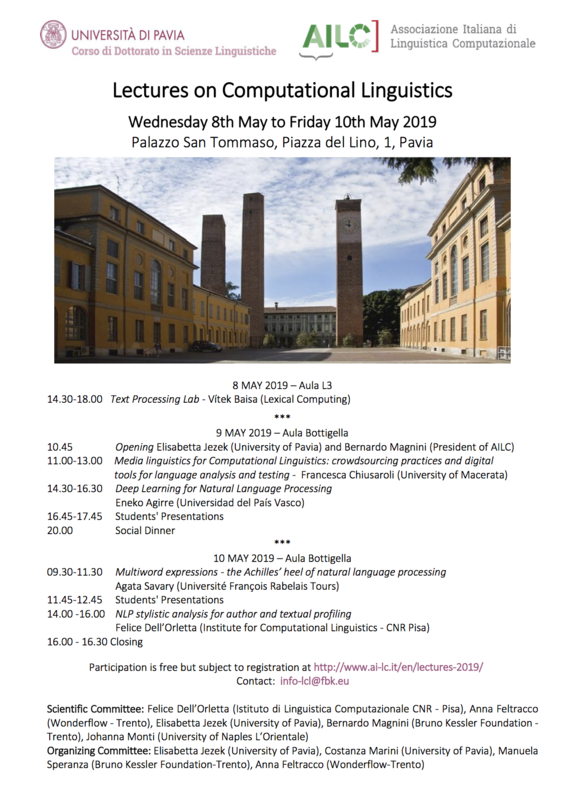 2016 "Lexical Resources: A Linguistic Overview", Lectures in Computational Linguistics, Fondazione Bruno Kessler and PhD School in Language Sciences University of Pavia, Trento, May 5-6. 2016 "Introduzione allo studio del lessico", Università Cattolica del Sacro Cuore, Dipartimento di Filosofia, CIRCSE, Milan, Apr. 21. 2016 "Relazione tra eventi nel lessico e loro rappresentazione", Linguaggio a Roma Tre, Università Roma Tre, Apr. 14. 2016 "The Lexicon: An introduction" Vrije Universiteit Amsterdam, Computational Lexicology and Terminology Lab, Feb. 24. 2015 "Corpus Patterns for Semantic Processing", with Patrick Hanks, Octavian Popescu and Daisuke Kawahara. Tutorial at the 53rd Annual Meeting of the Association for Computational Linguistics (ACL 2015) and 7th International Joint Conference on NLP of the Asian Federation of NLP, Beijng, July 26. 2015 "Tipi di polisemia nel lessico"; PhD Program in Linguistics, Università di Pisa, Pisa, June 10. 2015 "Classi di Verbi tra Sintassi, Semantica e Ontologia", "Metafora e Collocazioni"; PhD Program in Linguistics, Università di Torino, Torino, Feb. 24. 2015 "Rappresentazioni lessicali e composizione semantica nel Lessico Generativo: tra dati e teoria", PhD Program in Philosophy, Università di Roma Tre, Roma, Jan. 27-28. 2014 "Lexical Resources and Modelization". Compter, parler, soigner. Tra linguistica e Intelligenza Artificiale, Collegio Ghislieri, Pavia, Dec. 15-17. 2014 "La metafora nei verbi", with Malvina Nissim. Scuola Invernale TRIPLE, Espansione semantica in sincronia e diacronia. Modelli e Rappresentazioni, Universita' di Roma Tre, Feb. 15/17. 2014 Distributional Analysis of copredication; Towards Distinguishing Systematic Polysemy from Coercion, Workshop on Systematic Polysemy and complex/dot types, Toulouse, IRIT, Apr. 18, with Laure Vieu. 2013. "Corpus Patterns", with Patrick Hanks, Octavian Popescu. Tutorial at the Joint Symposium on Semantic Processing JSSP 2013, Fondazione Bruno Kessler, Trento, November 20-22, 2013. 2013 "Sweetening Ontologies cont'd", Joint Symposium on Semantic Processing JSSP 2013, Fondazione Bruno Kessler, Trento, Nov. 20-22. 2013 "Classi lessicali tra grammatica, semantica e ontologia", Dipartimento di Studi Linguistici e Culturali Comparati, Università Ca' Foscari di Venezia, Apr. 15. 2012 "On the notion of verbal frame and frame relation". PhD program in Linguistics, Università di Pavia, Nov. 15. 2012 "Acquiring typed predicate-argument structures for motion verbs from corpora". Jornadas Internacionales. Los verbos de movimiente: estudio teórico y aplicación lexicográfica, Universidad Autónoma de Madrid, 4-5 octubre. 2012 "Challenges to distributional methods". Graduate course on Quantitative methods and corpora in linguistics, Università di Pavia, 10-21 settembre. 2012 "Capturing coercions in texts". Workshop Semantic and Pragmatic Annotation of Corpora, Heinrich-Heine-Universitat Düsseldorf, July 16. 2011 "Extending Senso Comune with verbal frames". Workshop Senso Comune, ISTC-CNR, Trento, 27 febbraio, with Laure Vieu. 2011 "Aquiring typed predicate-argument structures from corpora". Heinrich-Heine-Universitat Düsseldorf, Institüt für Sprache und Information, Nov 10. 2011 "Vocaosbolario". VeDrò nel caos, Drò, 29-31 agosto. 2011 "Aquiring typed predicate-argument structures from corpora". Fondazione Bruno Kessler (FBK), Trento, 19 maggio. 2011 "Acquisizione di strutture argomentali “tipate” da corpora". Workshop Senso Comune, ISTC-CNR, Roma, 23 marzo. 2011 "Tra riferimento e significato". Dialoghi sulle lingue e sul linguaggio. Dipartimento di Studi Linguistici e Orientali, Università di Bologna, 24 febbraio. 2011 Il lemma e l'informazione semantica e pragmatica", con Alessandro Lenci. Scuola Invernale TRIPLE. Il lessico: metodi di analisi, modelli e applicazioni, Università di Roma Tre, Jan. 24-28. 2010 "La Struttura Argomentale dei Verbi", "La realizzazione degli Argomenti". Scuola Invernale TRIPLE. Il lessico: metodi di analisi, modelli e applicazioni, Università di Roma Tre, Jan. 25-29. 2009 "Semantic Coercion in Language: Beyond Distributional Analysis". Centre for Mind/Brain Sciences CiMEC, University of Trento, Rovereto, Feb. 12. 2009 "Lessico e Significato", "La modulazione del senso in contesto". Scuola Invernale TRIPLE. Il lessico: metodi di analisi, modelli e applicazioni, Università di Roma Tre, Jan. 26-30. 2008 "Classi di Verbi Italiani tra Grammatica e Significato". Accademia della Crusca, Firenze, Dec. 15. 2008 "Tra teoria e corpus: anche e "quasi sinonimi" in contesto". International Workshop on Discourse Markers in Romance Languages. University of Oslo, Nov. 28-29, with Cecilia Andorno. 2008 "Aspetti semantici della Struttura argomentale". Università di Napoli Federico II, Nov. 7. 2008 "La costruzione sintagmatica del significato". Linguaggio a Roma Tre. Università di Roma Tre, April 10. 2008 "Aspetti sintattici, semantici e pragmatici della valenza verbale". Warsaw University, Italian Dept., May 21-24. 2007 "Structure argumentale des verbes: théories et applications" Colloque International sur La recherche en langues romanes, Université Sorbonne Nouvelle-Paris III, June 29-30. 2007 "Linguistic properties of collocations across languages". National Seoul University, South Korea, Dept. of French Language and Literature, 5 maggio. 2007 "What is a collocation? Accounting for selectional preferences in the Lexicon". National Seoul University, South Korea, Dept. of French Language and Literature, 5 maggio. 2007 "Corpus explorations of semantic typing and coercion phenomena". Brandeis University, Dept. of Computer Science, Waltham Mass., March 13. 2005 "Verbi riflessivi, pronominali e medi". Seminar. Accademia della Crusca, Firenze, March 16. 2004 "Lessicologia e Lessicografia italiana". Seminar (Erasmus Teaching Mobility Program). ELTE University, Budapest, Italian Dept., Sept. 20-24. 2004 "Aspetti della struttura del verbo italiano tra sintassi e semantica". Istituto di Linguistica Computazionale (ILC), Centro Nazionale delle Ricerche (CNR), Pisa, July 2. 2004 "Types et degrés des verbes supports en italien". Colloque International sur Les verbes supports: nouvel état des lieux, Université de Paris XIII, May 13-14. 1997 "Lessico, Dizionari e Apprendimento". Italian Cultural Institute in Madrid, Universidad Madrid La Complutense, Universidad Castilla La Mancha, Madrid, Nov. 24-28. 1996 "La redazione di un vocabolario bilingue: aspetti e problemi". Trento University, Faculty of Humanities (Apr. ), European Academy in Bolzano (Dec.).